Transport protein particle (TRAPP) is a supramolecular protein complex that functions in localizing proteins to the Golgi compartment. 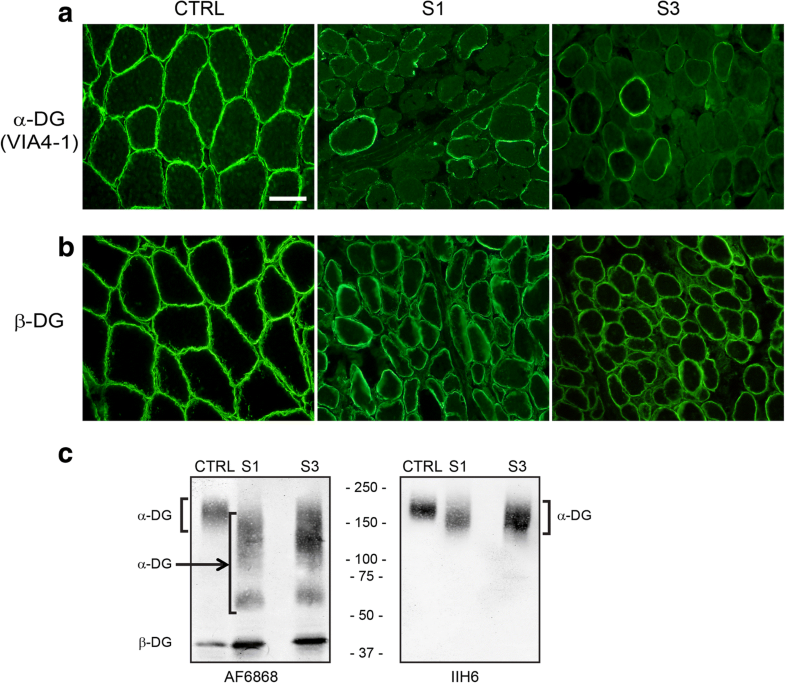 The TRAPPC11 subunit has been implicated in muscle disease by virtue of homozygous and compound heterozygous deleterious mutations being identified in individuals with limb girdle muscular dystrophy and congenital muscular dystrophy. It remains unclear how this protein leads to muscle disease. Furthermore, a role for this protein, or any other membrane trafficking protein, in the etiology of the dystroglycanopathy group of muscular dystrophies has yet to be found. Here, using a multidisciplinary approach including genetics, immunofluorescence, western blotting, and live cell analysis, we implicate both TRAPPC11 and another membrane trafficking protein, GOSR2, in α-dystroglycan hypoglycosylation. Subject 1 presented with severe epileptic episodes and subsequent developmental deterioration. Upon clinical evaluation she was found to have brain, eye, and liver abnormalities. Her serum aminotransferases and creatine kinase were abnormally high. Subjects 2 and 3 are siblings from a family unrelated to subject 1. Both siblings displayed hypotonia, muscle weakness, low muscle bulk, and elevated creatine kinase levels. Subject 3 also developed a seizure disorder. Muscle biopsies from subjects 1 and 3 were severely dystrophic with abnormal immunofluorescence and western blotting indicative of α-dystroglycan hypoglycosylation. Compound heterozygous mutations in TRAPPC11 were identified in subject 1: c.851A>C and c.965+5G>T. Cellular biological analyses on fibroblasts confirmed abnormal membrane trafficking. Subject 3 was found to have compound heterozygous mutations in GOSR2: c.430G>T and c.2T>G. Cellular biological analyses on fibroblasts from subject 3 using two different model cargo proteins did not reveal defects in protein transport. No mutations were found in any of the genes currently known to cause dystroglycanopathy in either individual. Recessive mutations in TRAPPC11 and GOSR2 are associated with congenital muscular dystrophy and hypoglycosylation of α-dystroglycan. This is the first report linking membrane trafficking proteins to dystroglycanopathy and suggests that these genes should be considered in the diagnostic evaluation of patients with congenital muscular dystrophy and dystroglycanopathy. Dystroglycanopathies are a group of muscular dystrophies resulting from abnormal glycosylation of α-dystroglycan (α-DG) that leads to reduced binding affinity for extracellular matrix proteins . The clinical phenotypes span a broad range from the congenital muscular dystrophies (CMDs) with brain and eye malformations to adult-onset limb-girdle muscular dystrophy (LGMD) . Dystroglycan is encoded by DAG1 and is cleaved into α-DG and β-DG after translation . DAG1 is widely expressed in different human tissues, consistent with the multi-organ phenotypes of many individuals with the most severe forms of dystroglycanopathy . Mutations in DAG1 itself as well as 17 other genes have been reported in patients with dystroglycanopathy. These include glycosyltransferases (POMT1, POMT2, POMGNT1, POMGNT2, B3GALNT2, B3GNT1, LARGE, TMEM5), a kinase (POMK), five genes encoding enzymes necessary for dolichol-P-mannose (dol-P-man) synthesis (DOLK, DPM1, DPM2, DPM3, and GMPPB), and three genes encoding proteins necessary for joining the α-DG-linked core glycan structure with the distal ligand-binding region of the structure via a ribitol phosphate disaccharide (FKTN, FKRP, ISPD) . To date, no membrane trafficking proteins have been implicated in dystroglycanopathies. In this study, we report clinical, histopathological, biochemical, and molecular genetic data on two families with CMD and hypoglycosylation of α-DG. Two genes, TRAPPC11 and GOSR2, that each have a role in membrane trafficking in the biosynthetic pathway have been implicated as candidate dystroglycanopathy genes. They represent the first membrane trafficking proteins implicated in α-DG hypoglycosylation. Since TRAPPC11 mutations have been reported in a number of individuals suffering from a muscular dystrophy, and these individuals also display membrane trafficking defects in cultured fibroblasts, this gene should be considered in the diagnostic evaluation of patients with CMD. Subject 1 presented with status epilepticus in the setting of a vomiting illness at 6 months of age. Magnetic resonance imaging (MRI) of the brain showed bilateral multifocal restricted diffusion of the cortex, the cerebral white matter, and the pons (Fig. 1a). Her serum aminotransferases were elevated with alanine aminotransferase (ALT) of ~ 1600 U/L and aspartate aminotransferase (AST) ~ 400 U/L as well as a prolonged prothrombin time of 20.7 s (normal range is 12–15 s), consistent with synthetic liver dysfunction. The approximately 4:1 ALT to AST ratio was consistent over multiple measurements. Creatine kinase (CK) at initial presentation was 3500 U/L. She had significant regression of development with loss of rolling and sitting, loss of fine motor and verbal skills, and inability to feed orally after this illness. MRI of the lower extremities showed high signal on short tau inversion recovery (STIR) sequences of the deep and superficial posterior compartments bilaterally (Fig. 1c). Skeletal muscle and liver biopsies were obtained at 9 months of age. Liver biopsy showed microvesicular steatosis (Fig. 1d, e). Skeletal muscle showed an active dystrophic process (Fig. 1g) and hypoglycosylation of α-DG by both immunofluorescence and western blotting (Fig. 2). In contrast, α-DG in cultured fibroblasts was indistinguishable from control fibroblasts in on-cell and in WGA glycoprotein western blots (data not shown). This is not uncommon and has been reported in the case of other genes involved in dystroglycanopathy [6, 7]. The patient had several subsequent acute infectious illnesses with seizures and neurological regression. Follow-up brain MRI at 15 months of age showed marked progressive volume loss (Fig. 1b). Glycosylation analysis of transferrin and ApoCIII proteins in serum by affinity chromatography-mass spectrometry (Mayo Medical Laboratory) as well as by MALDI-TOF mass spectrometry (Emory Genetics Laboratory) was normal. In her last evaluation, at 3 years and 6 months of age, she was areflexic with limited antigravity strength and severe hypotonia. She fed exclusively via gastrostomy tube with no verbal communication. Seizures were well controlled on levetiracetam monotherapy. CK remained elevated with values as high as 19,000 U/L. She had mild hepatomegaly and aminotransferases were still significantly elevated with 4:1 ALT to AST ratio, but there was no coagulopathy or hyperbilirubinemia. She chronically required noninvasive positive pressure ventilation with sleep. After multiple hospital admissions for viral respiratory infections, she underwent immunological evaluation and was found to have impaired natural killer cell function on multiple repeated analyses. She did not have peripheral neuropathy, cataracts, alacrima, achalasia, renal disease, hearing loss, or cholestasis. Exome trio sequencing showed compound heterozygous rare variants in trans in TRAPPC11 (NM_021942): c.851A>C (p.Q284P) and c.965+5G>T (intron 9 splice site disruptor). The p.Q284P missense mutation was absent from the Exome Aggregation Consortium (ExAC) database, and c.965+5G>T was present in 2/119,770 alleles . The latter mutation resulted in a transcript that lacks exon 9 and the first 88 bases of exon 10 (Fig. 3a) and is predicted to result in an in-frame deletion of amino acids 278–351 (p.I278_Q351del). Cultured fibroblasts had greatly reduced levels of TRAPPC11 (Fig. 3b) suggesting the p.Q284P protein and the predicted p.I278_Q351del protein are unstable. These fibroblasts showed a delay in the maturation of the marker protein VSVG-GFP ts045 (Fig. 3c, d). Analysis of live-cell trafficking revealed a delay in the release of VSVG-GFP ts045 from the Golgi (Fig. 3e, f) as well as a delay in arrival of a Golgi marker (sialyl transferase-SBP-GFP) from the endoplasmic reticulum (Fig. 3g, h). The delayed release of protein from the Golgi is consistent with the initial findings reported by Bögershausen et al. in LGMD2S patients with TRAPPC11 mutations , and the delayed arrival of protein to the Golgi is consistent with the findings of Scrivens et al. .
Subject 2 presented for medical evaluation at age 6 months for hypotonia. She was found to have CK values of up to ~ 5000 U/L. She developed absence seizures at age 2 years. She had steadily progressive muscle weakness. On examination at age 4 years and 9 months, she was areflexic. She had low muscle bulk and myopathic facial appearance and did not have antigravity strength. She had fine nystagmus but otherwise intact extraocular movements. MRI of the brain was normal at ages 2 and 4 years. She died due to respiratory failure at age 5 years. Subject 3 is the younger sister of subject 2. She was noted to have muscle weakness and hypotonia at 3 months of age. At 9 months, she had antigravity strength only. Serum CK value was 1760 U/L. At 19 months, skeletal muscle biopsy was obtained showing an active dystrophic process (Fig. 1h) and hypoglycosylation of α-DG by both immunofluorescence and western blotting (Fig. 2). In contrast, α-DG in cultured fibroblasts was indistinguishable from control fibroblasts in on-cell and in WGA glycoprotein western blots (data not shown). Furthermore, the VSVG-GFP membrane trafficking assay kinetics as well as arrival of the Golgi marker was indistinguishable from control fibroblasts (Fig. 3c–f). At age 2.5 years, she developed a seizure disorder characterized as focal seizures but later as both focal and generalized, which often became intractable and required hospitalization. Evaluation showed no evidence of nystagmus and ocular range of motion was full. There were no focal deficits and her cranial nerves were normal. She demonstrated severe weakness and muscular hypotonia. MRI of the brain showed diffuse volume loss resulting in ex vacuo ventriculomegaly. EEG at 2 years and 7 months of age showed runs of spike and wave discharges originating in the occipital lobe which were exacerbated by photic stimuli. Head circumference was at the 30th centile, height at the 10th centile, and weight below the 1st centile. At 3.5 years of age, she developed episodes of vomiting and apparent abdominal pain. This led to the detection of elevated ALT of up to 700 U/L. An extensive evaluation for infectious, anatomical, autoimmune, and metabolic etiologies of liver disease was nondiagnostic. Physical exam revealed findings similar to her sister. Apart from her sister, there is no family history of neuromuscular disease. The subject is now 6 years of age with medically refractory epilepsy and progressive severe muscle weakness. Clinical exome trio sequencing was performed, and no relevant sequence variants were initially reported. In a targeted sequencing panel, subject 3 was found to have compound heterozygous rare variants in GOSR2 (NM_001012511): c.430G>T (p.G144W) and c.2T>G. Retrospective evaluation of GOSR2 in the whole exome sequencing (WES) data confirmed that both variants were present in subject 3 and were in trans. 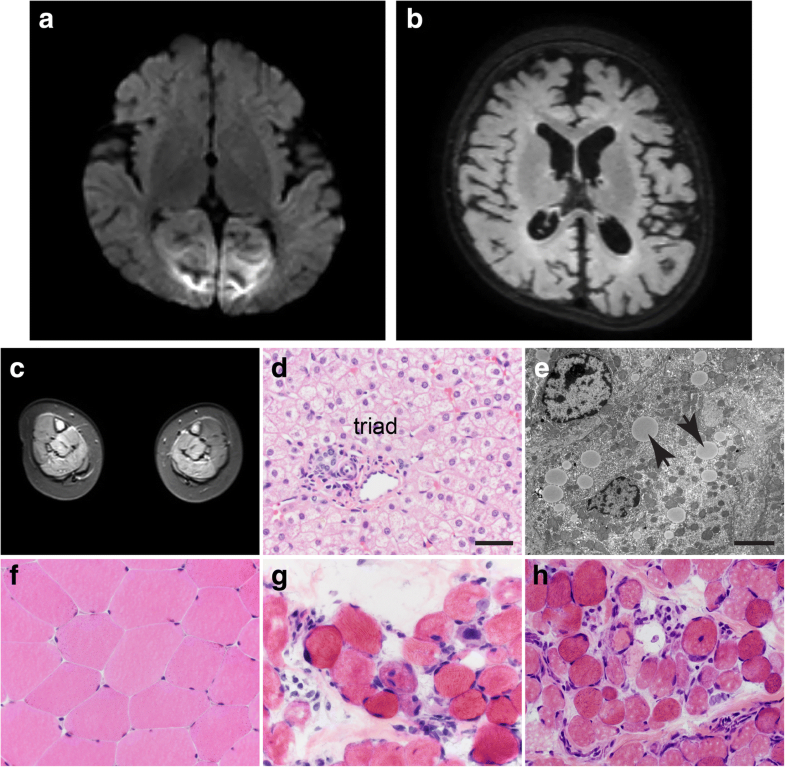 Extensive re-evaluation of seizure and dystroglycanopathy loci in the WES failed to identify any other pathologic variants. The GOSR2 p.G144W missense variant is a previously reported disease-causing mutation and is present in 5/121,408 alleles in the ExAC database with no homozygous individuals. The second variant (c.2T>G) is present in 1/18,808 alleles in the ExAC database . The mutation is likely to result in the use of an alternate start codon with elimination of 18 amino acids from the amino-terminus of the protein according to MutationTaster2 and is presumed to be pathogenic as a result . In this report, we show that mutations in two genes encoding proteins involved in membrane trafficking, TRAPPC11 and GOSR2, are associated with CMD and dystroglycanopathy. Biallelic mutations in TRAPPC11 were initially reported as the etiology of LGMD2S in 2013  and have since been associated with a variety of multisystemic phenotypic findings including intellectual disability, seizures, microcephaly, cerebral atrophy, cataracts, alacrima, achalasia, hepatic steatosis, and cholestatic liver disease, in addition to muscular dystrophy [9, 12–15]. Comparisons between subject 1 and all published mutations in TRAPPC11 and associated phenotypes are summarized in Table 1. Our study now adds two new mutations with functional validation and categorizes TRAPPC11-related disease as a dystroglycanopathy. TRAPPC11 dysfunction may contribute to disease pathophysiology in several ways. Extensive functional studies of cultured fibroblasts were conducted by Bögershausen et al. . They demonstrated that cells had abnormally fragmented and diffuse Golgi; delayed traffic out of the Golgi and the proteins LAMP1 and LAMP2 were found to be abnormally glycosylated. TRAPP (transport protein particle) forms several related multisubunit trafficking complexes (MTCs) that participate in the tethering of vesicles to target membranes, including vesicles associated with the Golgi . Since the Golgi is the major site of protein glycosylation in the cell , defects in Golgi morphology and traffic can result in protein glycosylation defects. Recently, abnormal glycosylation of serum transferrin was described in a patient with compound heterozygous mutations in TRAPPC11, consistent with a type 2 disorder of glycosylation . We were unable to detect abnormalities in glycosylation of serum transferrin using two different commonly employed methods. Thus, while TRAPPC11-related disease is a disorder of glycosylation, analysis of glycoepitopes of secreted proteins may not be a sensitive test for diagnostic purposes. 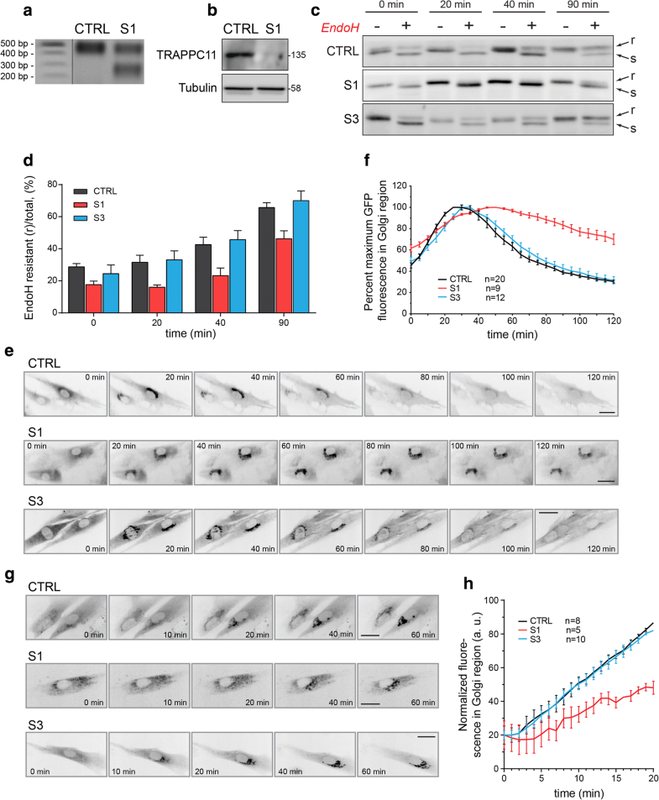 The zebrafish model of TRAPPC11-related disease shows generalized impairment of N-linked glycosylation as well as depletion of lipid-linked oligosaccharides (LLOs) . The inability to synthesize dolichol-P-mannose (dol-P-man), a lipid-linked saccharide, is a known cause of dystroglycanopathy . Expression of multiple glycosylation-related genes (including the known etiologies of dystroglycanopathy gmppb, dpm1, dpm2, and dpm3) showed significant compensatory upregulation in the trappc11 fish . Interestingly, TRAPPC11 siRNA knockdown in HeLa cells had a specific inhibitory effect on glycosylation that was not present with knockdown of other components of the TRAPP complex. This led to the conclusion that TRAPPC11 may have another function that is independent of its role in vesicle transport and led to speculation that impaired LLO synthesis may be the most relevant function of TRAPPC11 in the process of protein glycosylation . Finally, trappc11 zebrafish mutations were shown to lead to fatty liver via a pathological activation of the unfolded protein response. This may be relevant to subject 1 as well as the other reported individuals with hepatopathy and TRAPPC11-related disease . Taken together, several mechanisms for the role of TRAPPC11 in muscular and hepatic phenotypes are known and can explain many clinical features of subject 1. Human mutations in GOSR2 were first reported in 2011 in six individuals with the same homozygous missense mutation (c.430G>T) who had progressive myoclonus epilepsy (PME), ataxia, scoliosis, and mildly elevated serum CK (see Table 1 for a comparison between subjects 2 and 3 with all reported GOSR2 mutations) . All individuals were areflexic in early childhood and were non-ambulatory by adolescence or early adulthood. Muscle histology and EMG were normal. An additional eleven individuals with similar clinical presentations and the same homozygous mutation were reported in 2013 and 2014 [19, 20]. The maximum CK value reported in any of the patients was 2467 U/L. There was no specific assessment of α-DG glycosylation in their muscle biopsies. Subjects 2 and 3 in our study have a much more severe phenotype. Since CMD represents the severe end of the clinical spectrum of GOSR2-related disease and PME represents the milder end of the spectrum, the new c.2T>G mutation resulting in CMD reported in our study likely cause more severe perturbation of Golgi function than the common c.430G>T mutation. It remains unclear which aspect of Golgi function is affected since a membrane trafficking defect in neither the VSVG-GFP marker protein nor a resident Golgi enzyme was detected. Future studies should examine the trafficking of Golgi-localized glycosyl transferases that are responsible for α-DG processing. GOSR2 encodes a Golgi Qb-SNARE (soluble N-ethylmaleimide-sensitive factor attachment protein receptor) protein. In the cell, GOSR2 localizes to the cis-Golgi and mediates docking and fusion of vesicles originating from the ER. There is precedent for Golgi dysfunction leading to diseases manifesting with abnormal glycosylation and multisystemic disease. Examples include the disease caused by mutations in genes that encode the COG (conserved oligomeric Golgi) complex, an MTC that localizes to the Golgi . Additionally, an individual has been described with CMD due to homozygous mutations in GOLGA2, a golgin protein that also impacts Golgi function . The potential for a link between aberrant Golgi trafficking and dystroglycanopathy stems from an experiment employing a modified virus that required normally glycosylated α-DG for cell entry. Knockouts of known dystroglycanopathy genes in cultured fibroblasts resulted in impaired viral cell entry. Among the other knockouts shown to impair viral cell entry were those cells with mutations in several of the COG complex genes . Dystroglycanopathies result in muscular dystrophy due to dysfunctional linkage of the sarcolemma to the extracellular matrix. This linkage occurs via α-DG and relies on the synthesis of a complex LARGE-glycan for normal function . Since the initial descriptions of dystroglycanopathy [1, 24–26], a variety of molecular mechanisms of the diseases have been discovered. Specific glycosyltransferases such as POMT1/POMT2 are required to construct the core glycan structure that is linked to α-DG [25, 26]. Mutations in DOLK, DPM1, DPM2, DPM3, and GMPPB likely lead to a deficiency of dol-P-man (a lipid-linked monosaccharide) resulting in abnormal N-linked glycosylation as well as the O-linked mannosylation defect that results in dystroglycanopathy [6, 7, 27–31]. LARGE synthesizes the extracellular matrix binding region of the glycan structure (matriglycan) that is distal to the core region . Most recently, FKTN, FKRP, and ISPD have been implicated in the addition of ribitol phosphate molecules to link the core and ligand-binding regions of the α-DG glycan structure [33–35]. Our study suggests that TRAPPC11 and GOSR2 are also involved in the trafficking and glycosylation of dystroglycan in the Golgi. This represents the first report of an association between these genes and α-DG hypoglycosylation. It remains to be seen if other GOSR2 mutations associate with similar cellular and clinical phenotypes. Given the number of individuals with TRAPPC11 mutation-associated muscular dystrophy, it may be prudent for this gene to now be considered in the diagnostic evaluation of patients with dystroglycanopathy. Austin A. Larson, Peter R. Baker II, Miroslav P. Milev, Michael Sacher and Steven A. Moore contributed equally to this work. We are grateful to members of our laboratories for constructive comments on this report and for fruitful discussions. SAM and MOC are funded by the Iowa Wellstone Muscular Dystrophy Cooperative Research Center U54, NS053672. MS is funded by the Canadian Institutes of Health Research and the Natural Sciences and Engineering Research Council of Canada. RJS is funded by NCATS/NIH, UL1TR001082. AAL designed the study and drafted the manuscript. PRB II designed the study and edited the manuscript. MPM performed the cell biological membrane trafficking assays and edited the manuscript. CAP and RJS edited the manuscript. MOC grew the fibroblast cultures and performed western blots. JKL, AAS, and ADB developed the dystroglycanopathy sequencing panel and performed genetic evaluation of subject 3. JMM evaluated the sequencing data and provided a muscle biopsy for subject 3. KP performed the biochemical membrane trafficking assay. TFT analyzed the splicing defect in subject 1. CAW evaluated the subject 3. MS designed the study and edited the manuscript. SAM designed the study, evaluated the muscle biopsy and cultured fibroblasts, coordinated the clinical groups, and edited the manuscript. All authors read and approved the final manuscript. All studies were completed according to local ethical approval of the institutional review boards. All individuals or their guardians gave written informed consent before undergoing evaluation and testing, in agreement with the Declaration of Helsinki and approved by the ethical committees of the centers participating in this study, where biological samples were obtained. Consent for publication has been obtained by the participants or their legal guardians.